We arrived in the tiny airport in Flores/Santa Elena at 1830 and took a taxi (3 km) to Isla de Flores, a tiny island in Lago de Petén connected to the shore by a 500 m causeway. We were welcomed by lots of men in women’s clothing, most of them quite drunk and wet after swimming in the lake. We stayed at Hotel Isla de Flores, a very nice hotel in the middle of town. Shortly after we checked in a lot of noise started outside, and the reception called to apologize. 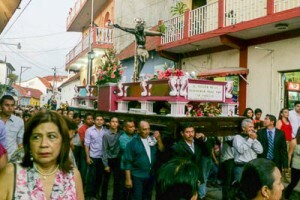 It turned out to be The festival of the Black Christ, a celebration of a holy statue in Esquipulas combined with a lot of Mayan traditions. This included several parades, marching bands, firecrackers, fireworks, conserts, markets, street food and somehow the men in drag, and a big part of it happened on the central square just a few meters from our hotel. Luckily the double windows were reducing the noise a lot, because they kept going most of the night and started again early in the morning. 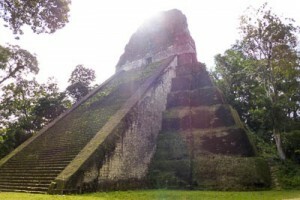 Our main reason for visiting Flores was Tikal, one of the biggest Mayan sites in the world (60 km2). The site is dominated by six giant pyramid-shaped temples up to 64 meters tall. In addition thousands of other structures, many not yet excavated, are found in the jungle of the Parque Nacional Tikal. The oldest buildings are from the 4th century BC and the city kept growing almost until it was abandoned in the 10th century. It wasn’t discovered until the 1940s, and declared a UNESCO world heritage site in 1979. The Great Plaza lays in the center of the site, surrounded by two of the largest temples, the palace complex Central Acropolis and North Acropolis where the city’s royals were buried. The Plaza of the seven temples has seven almost identical temples on one side, a triple ballcourt and several palaces. We were able to walk into the courtyard of Palacio de las Acanaladuras, climb the Talud-Tablero temple, and see the amazing view from the top of Temple IV (new stairs built on the side of the temple). 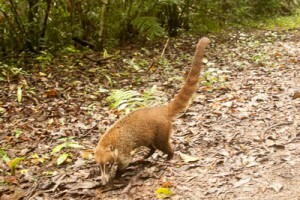 We were also lucky enough to see several spider monkeys, and an entire family of white-nosed coatis crossed the path right in front of us. Howler monkeys could be heard in the distance and birds were constantly flying over our heads. We had plenty of time to explore the city of Flores, even though we were only staying two nights. The city has only a few blocks in both directions, and walking around the entire island doesn’t take more than 15 minutes. 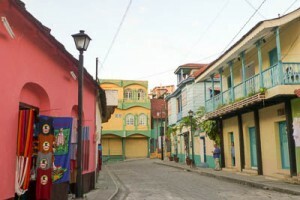 It’s a very charming city with narrow and steep streets, well-maintained colonial buildings in nice colors, people swimming in the lake all around and plenty of restaurants and bars. On our last evening, we ended up at a nice roof terrace (Sky bar) with a view towards the main plaza. 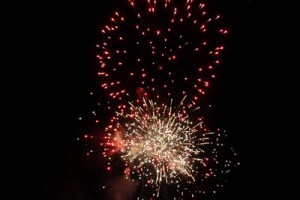 This was the last day of the festival, and it ended with an amazing firework show lasting for at least 20 minutes. Great way to end our visit here!